Describe and evaluate methods for measuring changes in abiotic and biotic components of an ecosystem along an environmental gradient. 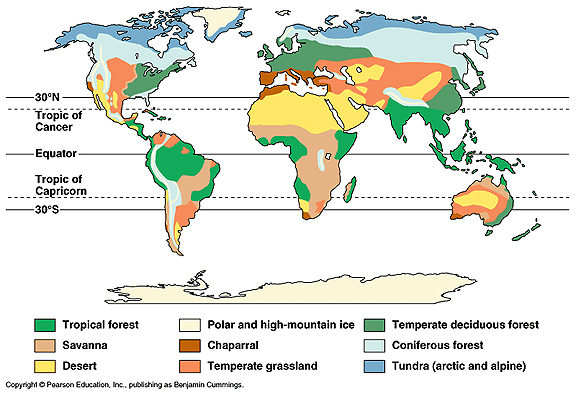 Ecological gradients are often found where two ecosystems meet. Biotic and abiotic factors change and form gradients in which then can be recorded. All parts of the gradient needs to be sampled, so a transect is used. The simplest one is when a line of tape is layed down across the area wanted to be measured then to take samples of all the organisms touching the tape. Many transects should be taken to obtain quantitative data. A belt transect is used for bigger samples. Describe and evaluate methods for measuring changes in abiotic and biotic components of an ecosystem due to a specific human activity. This caused an increase in thermal power which lead to more explosions. This contaminated soil, plants and animals. Fire fighters tried to turn it off, it took 5000 tonnes of sand, lead and clay. The UN gave £75 million to make it safe and it was fixed by an international team ten years later. Describe and evaluate the use of environmental impact assessment (EIA). Helps the decision making process by providing information about the consequences of the environment. Promotes sustainable development by identifying environmentally sound practice and migration measures for development. Planning process that governments set out in law when large developments are considered. They provide a documented way of examining environmental impacts that can be used as evidence in the decision making process of any new development. 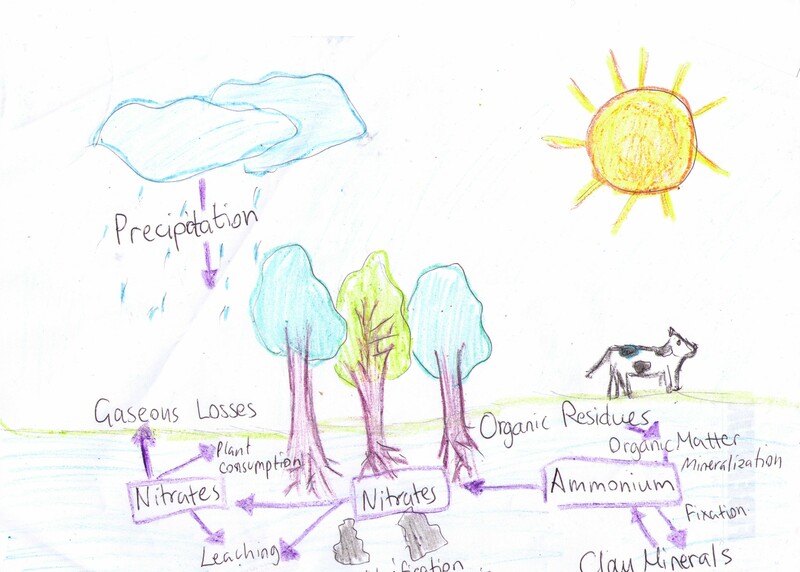 Explain the role of producers, consumers and decomposers in the ecosystem. Producer: can make their own food, as they use sunlight to make food and are called the basis of every ecosystem which helps the rest of the species through input of energy and new biomass. 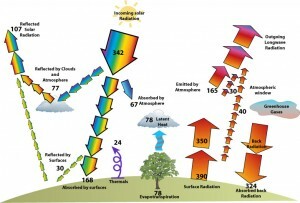 This all happens through photosynthesis which is the process when the producer uses the sun for energy. Consumer: feed on other organisms, they do not contain photosynthesis pigments so they cannot make their own food. They have to get energy, minerals and nutrients by eating other organisms. This makes the heterotrophs. Herbivores feed on autotrophs, carnivores on other heterotrophs and omnivores on both. Decomposer: get their food from the breakdown of a dead organism matter. They break down tissue and release nutrients for absorption by other producers. Decomposers also improve the nutrient capacity in the soil by breaking down the organic material. Describe photosynthesis and respiration in terms of inputs, outputs and energy transformations. Photosynthesis: needs carbon dioxide, water, chlorofyll and certain visible wave lengths of light to produce organic matter and oxygen. processes: chlorofyll traps sunlight; energy is used to split water molecules; hydrogen from water is combined with carbon dioxide to produce glucose. outputs: glucose used as an energy source for the plant and as a building block for other organic molecules; oxygen is released to the atmosphere through stomata. transformations: light energy is transformed to store chemical energy. Respiration: needs organic matter and oxygen to produce carbon dioxide and water. 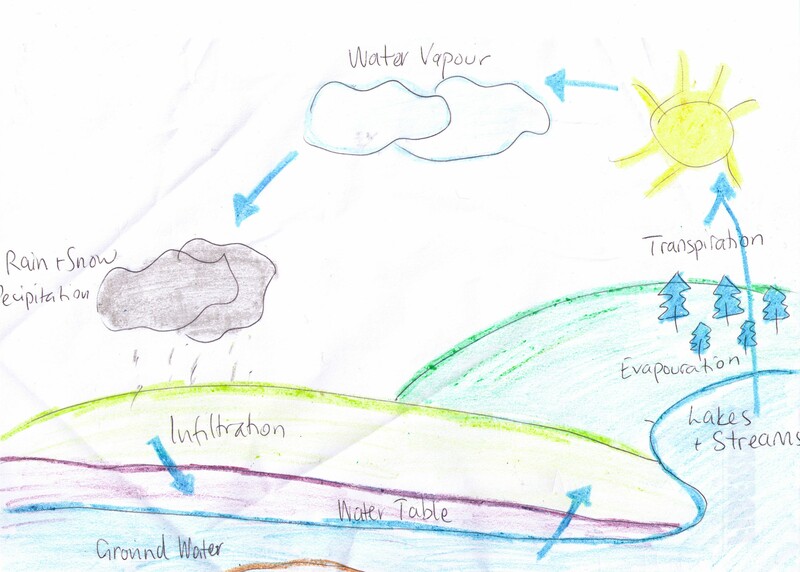 Describe and explain the transfer and transformation of energy as it flows through an ecosystem. 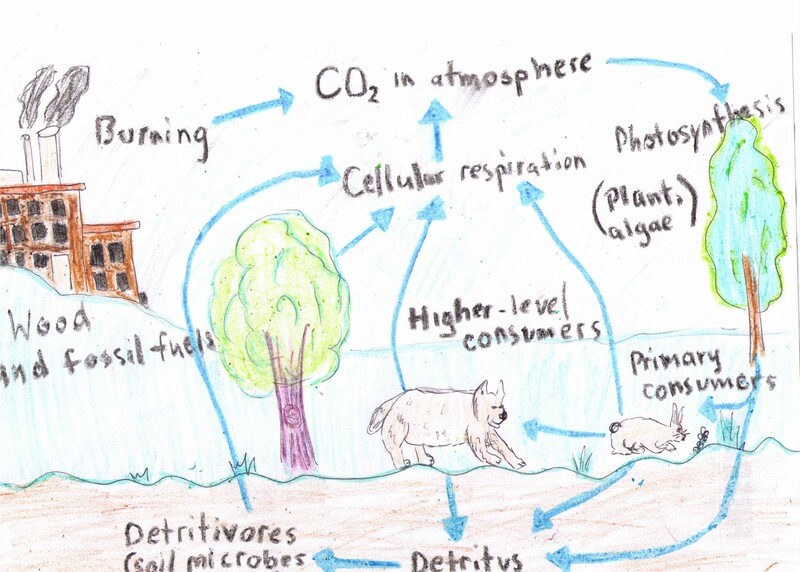 In this diagram we can see the energy flow through an ecosystem. Describe and explain transfer and transformation of materials such as they cycle within an ecosystem. Define the terms gross productivity, net productivity, primary productivity, and secondary productivity. *Productivity is production per unit time. Primary productivity is the gain by producers (autotrophs) in energy or biomass per unit area per unit time. It is when solar energy is converted, it depends on the amount of sunlight the ability of the producers to use energy to synthesize organic compounds and the availability of other things needed for growth, like minerals and nutrients. Primary production is highest were conditions for growth are optimal, where there are high levels of insolation, good water supply, warm temperatures and high nutrient levels. You can then divide primary productivity into gross and net profits. Secondary productivity depends on the amount of food there is and the efficiency of the consumers turning this into new biomass. Unlike the primary productivity net productivity involves feeding or absorption. Gross productivity (GP): The total gain in energy or biomass per unit area per unit time. Net productivity (NP): The gain of energy or biomass per unit area per unit time remaining after allowing for respiratory losses. It is the energy left for the next trophic level to consume. Define the terms and calculate the values of both gross primary productivity and net primary productivity from given data. Gross primary productivity (GPP): is gained through photosynthesis in primary producers. Define the terms and calculate the values of both gross secondary productivity and net secondary productivity from given data. Gross secondary productivity(GSP): is gained through absorption in consumers. Net secondary productivity(NSP): The gain by consumers in energy or biomass per unit area per unit time remaining after allowing for respiratory losses. List the significant abiotic (physical) factors of an ecosystem. Marine: the sea, salt marshes mangroves are all characterized by the salt content. Freshwater: rivers, lakes and wetlands. Describe and evaluate methods for measuring at least three abiotic (physical) factors within an ecosystem. salinity: this can be measured using electrical conductivity ( with a datalogger) or by the density of the water (water with high salt content is more denser than low-salt water). pH: this can be measured using a pH meter, or datalogging pH probe. Indicator solution may also be used. temperature: ordinary thermometers are too fragile to use for fieldwork, and are hard to read. An electric thermometer allows temperature to be measured in depth. dissolved oxygen: a meter with oxygen-sensitive electrodes connected that measures dissolved oxygen. One should be careful as doing things wrong may contaminate the air. wave action: this is measured by using a dynomometer which measures the force in waves. turbidity: can be measured using a Secchi disc, nephlometer or turbidimeter. flow velocity: can be measured by timing how long it takes a floating object to travel a certain distance or by using a flow-meter. light intensity: is measured using a light-meter. wind speed: a Beufort-scale is used to measure wind speed and precise measurements can be made with a digital anemometer. particle size: this determines the drainage and water-holding capacity and is measured by using a series of sieves. slope: this is measured using a clinometer and using a compass. soil moisture: by weighing the samples then heating them it shows the amount of water that has evaporated and the moisture levels. mineral content: the loss on the ignition test can determine mineral content. The samples are heated for several hours to let volatile substances to escape. Abiotic data can be collected using instruments that avoid issues of objectivity as they directly measure quantitative data. Instruments allow us to record data that would otherwise be beyond the limit of our perception. Explain difficulties in applying the concept of carrying capacity to local human populations. Resources used by humans are much more than any other species and when this source becomes limited humans begin to substitute one resource for another. The use of resources change from person to person, lifestyle to lifestyle, time to time and population to population. Developments in technology increase the changes of the resource consumption. The human population also import resources very often which come from outside their environment, which makes the grow beyond the boundaries set by their local resources and lets their carrying capacity increase. This however does not affect the global carrying capacity. These variables make it almost impossible to make reliable estimates of carrying capacities for the human populations. *Carrying capacity: The maximum number of a species or ”load” that can be sustainably supported by a given environment. Here we can see 3 models of a population growing and approaching carrying capacity. *Optimum population: the number of people which when working with all the available resources, will make the highest per capita economic return. it shows the point at which the population has the highest standard of living and quality of life. 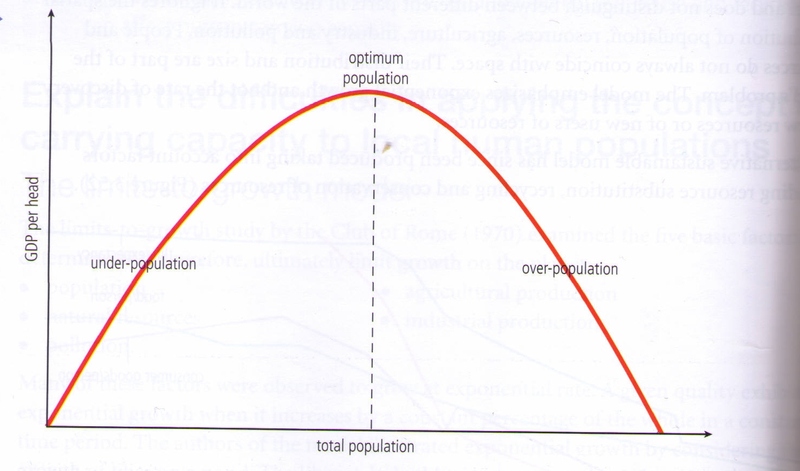 *Over-population: this happens when there are too many people compared to the resources and technology available for the standard of living. They suffer from natural disasters such as droughts and famine, low incomes, poverty, poor living conditions and a lot of emigration. *Under-population: this happens when there are too many resources in one area that is too much for the people living there. Countries like this could export their surplus food, energy and mineral resources. Explain how absolute reductions in energy and material use, reuse and recycling can affect human carrying capacity. Human carrying capacity is determined by the rate of energy and material consumption, the level of pollution and the extent of human interference in global life-support systems. While reuse and recycling reduce these impacts, they can also increase the human carrying capacity. *Recycle: when a household or industrial waste is reused and made into another product, like plastic, metals and paper. *Re-use: when a product is used more than once by returning it to the manufacturer or processor each time. This is very energy efficient and more efficient than recycling. *Reduce: this is when energy use is decrease for example turning off the lights when not needed or using the amount of water needed in a kettle. *Substitution: when using one resource over the other, the use of renewable source over a non-renewable source is a major benefit to the environment. As with all qualitative research, keep a diary while preparing for the interview, including all aspects of decision making. The topic is too personal – therefore the interview will not reveal the truth. Researcher bias: The researcher influences the researched in various ways – by their way of asking questions, how they respond to the answers and how the interpret data. Or for personal reasons (being intimidating etc. Possible solution: triangulation, reflexivity, less personal medium. Honesty and openness: Participants to not respond to the question asked. An individual interview. Allows the researcher to ask queastions directly to the participant(s). Can eb divided into structured, semi-structured and unstructured interviews. The researcher can direct the questions more than in a focus group. Less interaction will possibly lead to fewer new topics discussed and less spontainity. Group behaviour like conformity or dominance of some is avoided. Focus groups. Usually 6-10 members chosen by purposive sampling. Group leaders usually act as a facilitator of discussion, introducing topics, encouraging members to speak and try to maintain focus. Frequently used in market research but also to come up with research ideas. Time efficient – data collection from more people at the same time Participants may hold back, or not feel comfortable sharing their answers. Can be argued to be more natural in its setting than one-to-one interviews -> higher ecological validity Participants may feel a need to conform to the options of others. Specific set of questions are to be followed – no deviations allowed. – Appropriateness is already considered. – Standardized -> same questions for all -> triangulation. Contain a basic structure, but alteration and additional questions are allowed. Varies between closed and open-ended questions. – Good compromise – looseness of unstructure together with the focus from the structured interview. – Leads to rich data compared to structured interview. – More difficult to analyze than structured interview. – Still somewhat artificial compared to eg. narrative interview. Some preparations needed but allows for a free discussion of a topic. – Useful in theory, building where not enoigh research is done to justify particular questions. – Very depending in personality of the interviewed. This interview is supposed to reflect on the idea that storytelling is a way to remember and make sense of experience. Recent phenomenon. Aims to minimizer the influence of the researcher – only a few questions asked. – Researcher can then return to the interview situation and seek clarification but the original narrative remains intact for analysis. – Demands a lot from the participant -> big participant differences. Choice of participants: talkative, expressive etc. Use of pseudonyms (changing names of interviewee) etc. Acting different because of being recorded, the interviewer, the members in a focus group etc. Non-verbal elements such as sighs, nods, eye-flickering etc. Provides more credibility than the transcribed verbatim method!! Quantity: one or more researchers?